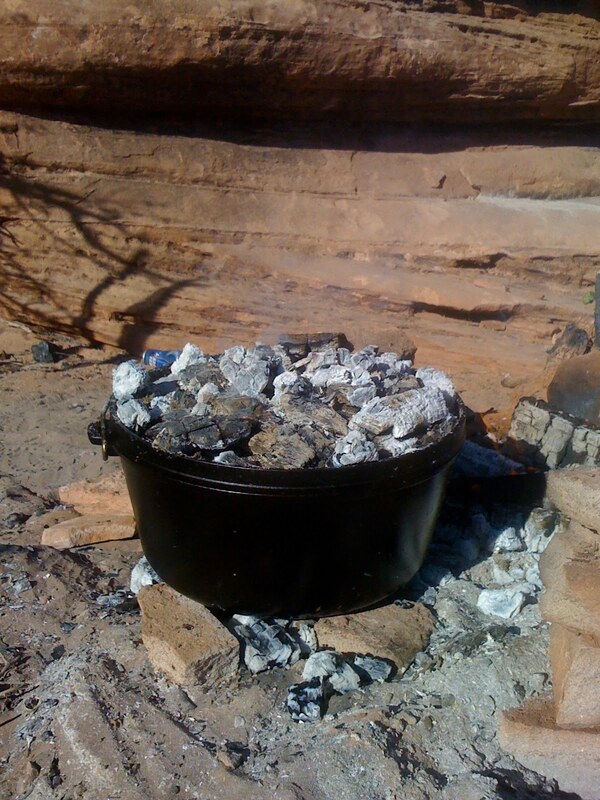 You can recognize a camp dutch oven by its legs—which keep it from directly contacting (and potentially crushing) any coals placed beneath it for cooking. Note: "Dutch" doesn't mean the thing came from Holland... it's a holdover from when "dutch" meant "ghetto". Most camp dutch ovens have a lip that surrounds the top of the lid. This lip holds in place any coals placed on top of the dutch oven for baking. Legend has it that Paul Revere invented the lipped dutch oven lid. Most camp dutch oven lids are designed for use as a griddle by flipping it upside down. Its slightly concave surface means everything slides to the center... but it works well for cooking eggs, bacon, pancakes, and more. A camp dutch oven is used for outdoor cooking. Most authorities and cookbooks follow the charcoal briquette method. This means you ignite charcoal briquettes like you'd use in your household barbeque, and then strategically place them under and on top of the camp dutch oven to achieve the right temperature for whatever it is you are cooking. You can also cook using a regular old campfire, and place wood coals on top for baking (shown at right). If using real wood charcoal, increase volume of coals from any recipe by about 50% over the volume of called-for briquettes. The reason for the extra volume when using real wood charcoal is that briquettes contain additives like coal dust, sodium nitrate, borax, parrafin, and other petroleum products—which makes them burn hotter and longer than wood. You can also place your dutch oven into a spot recently cleared of fire to add bottom heat. Some folks hang their dutch oven from a tripod for campfire cooking (which allows you to control heat by raising and lowering the dutch oven). Others nestle their camp dutch ovens among the coals of a settled fire (also shown at right), or build supports using rocks. You can, of course, place the camp dutch oven directly on a metal grate over a campfire. You can also use your camp dutch oven as a slow cooker / crock pot. To do this, dig a hole in the ground that's about 6 inches deeper than your dutch oven, and light a fire in the hole. Once the fire has burned to coals, remove half of those coals, leaving a base of about 3 inches at the bottom of the hole. Place the dutch oven (full of food) on top of the bottom layer of coals, and then pile the remaining coals on top (perhaps another 3 inches). Pile a few inches of dirt on top of the top layer of coals, and then cover it all with wet burlap to prevent sparks. Dig it back up in 10 hours. The effect approximates a slow cooker set on "low". In general, follow standard care instructions for bare cast iron. Of course, if you're camping, you may not have access to a sink, stove top, or oven. The basics are: 1) wash dirt, ashes, and food from the camp dutch oven with hot water and a non-abrasive (plastic bristles) scrubber, 2) dry with heat (in the sun, or over the fire), and then 3) oil the dutch oven inside and out so it's nice and shiny. Always start your cooking with a shiny dutch oven to keep it nonstick. Cool! I just went to store today to pick up a 5qt Lodge Dutch to cook some chicken noodle soup in. I dig the recipes and the tips on here... Keep up the good stuff! Thanks for the encouragement! And thanks for stopping by. If you have questions, comments, or stories to share... please let me know. Enjoy that new dutch oven, too. It's an amazing kitchen tool. Hello! i would like to know the size I should get in a dutch oven. We only have 3 adults. Only getting the one, and want one that you might cooke a whole chicken. Would a 4 quart round dutch oven hole a whole chicken? hope you get this message, you have a wonderful, informative site! I don't think you'd be able to fit a roasting chicken in a 4-quart dutch oven. I am usually only cooking for 3 or 4 people when I use my 8-quart, and don't ever feel that it's too big. It's also nice to have the extra size when you do end up cooking for more folks. Nice site! I used to cook a lot on camp dutch ovens. Now, not so much. I appreciate your use of real coals and not simply charcoal briquettes. Do you have any suggestions where I could find a vintage small dutch oven..perhaps a 6"? I haunt junk shops and flea markets, but most are at least in the 10" to 14" range. Very small 6"-8"and very large 16" are harder to find. In have a few 8" lodge ovens, but like what I have always called "flat bar" dutch ovens, I have no idea who manufactured them...probably produced in the early 1900's. Thanks for stopping by! I unfortunately do not have any useful suggestions for finding 6 to 8-inch dutch ovens. I'm usually with enough of a crowd that the 10-inch is as low as I go. Sorry I don't have more info for you. If you do end up finding one, please let us know!